In this April 25, 2018, file photo, DeMar DeRozan looks up at the scoreboard during a game against the Washington Wizards in Toronto. DeMar DeRozan will make an emotional return to the arena he called home for nine years when the San Antonio Spurs take on the Toronto Raptors at Scotiabank Arena on Feb. 22. The Raptors announced their 2018-19 schedule on Friday, and anticipation is expected to be high for DeRozan’s first appearance in Toronto since the Raptors traded him to the Spurs last month. 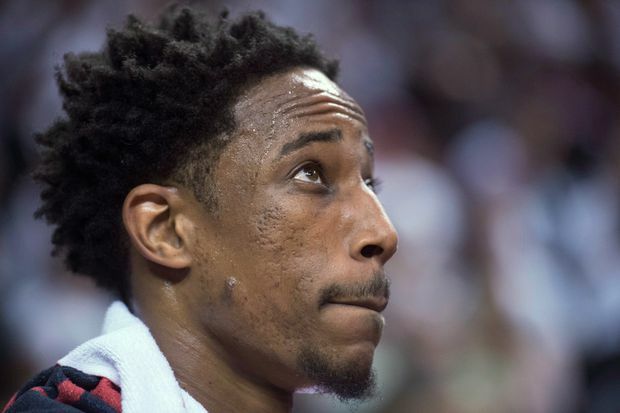 DeRozan was a four-time all-star and fan favourite in Toronto, but was sent to Texas in the trade that brought star forward Kawhi Leonard north in the aftermath of another disappointing playoff exit. Former head coach Dwane Casey, another Raptors off-season casualty, makes his return to Toronto Nov. 14. He’ll be coaching from the visitor’s bench with the Detroit Pistons. The Raptors open the season at home Oct. 17 against Cleveland, the team that swept Toronto out of the second round of the playoffs in two consecutive seasons. This will be a much different Cavaliers team, however, after superstar LeBron James left in the off-season to join the Los Angeles Lakers. King James makes his only Toronto appearance with his new team on March 14. The Raptors’ road debut is Oct. 20 at Washington, and they visit the Spurs on Jan 3. Leonard may get a hostile reception in his return to AT&T Center after effectively forcing his way out of San Antonio. The defending champion Golden State Warriors are at Scotiabank Arena on Nov. 29, and league MVP James Harden and the Houston Rockets come to Toronto on March 5.